Searching for eggs around the yard is an annual tradition for many families in the Spring, but first there is decorating to be done. Dyes are easy enough to find in stores this time of year. No special trip to the store is necessary this year. All the things you need are in or around your house. Decorating eggs has various historical roots. Eggs are a symbol of Springtime, and new life. 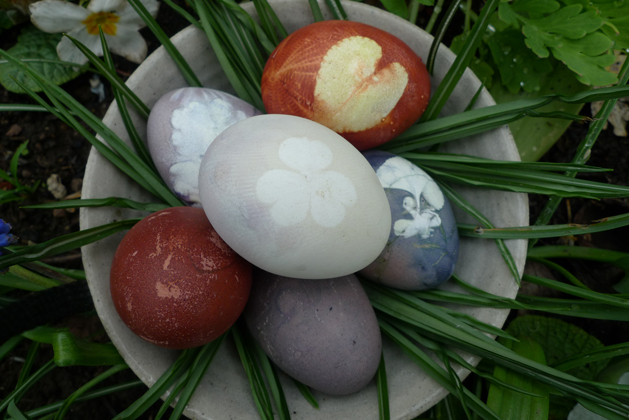 The ancient Zoroastrians painted eggs for their new year’s celebration, which falls on the spring equinox. Sculptures on the walls of Persepolis, capital of the Achaemenid Empire, show people carrying eggs to the king. Jewish Passover Sedar calls for hard-boiled eggs called Beitzah dipped in salt. Thanks to craft.com, we have a homemade recipe for your own beautiful eggs. This year start a new tradition at home by playing with flowers, clovers and pretty leafs as the inspiration for your beautiful eggs. So many things can be used as dye like berries and veggies – yep, a fun way to play with your veggies! Cut up your stockings into 4-5″ sections. Tie off one end. Wash the eggs in mildly soapy water to clean off any oils or residue that might keep the dye from being absorbed. Dry off the eggs and place them in the refrigerator until you’re ready to use. Choose leaves and flowers carefully, looking for interesting and distinctive shapes. Plants that can be pressed flat create interesting two-dimensional graphics. Carefully place the egg in the stocking pouch. Be careful, your plant could move around. This will get easier with practice. Tie off the other end of the stocking, making sure the stocking is stretched tightly as possible around the egg to hold your natural inspiration in place. Add the dye material – blueberries, raspberries, spinach, asparagus – with vinegar and eggs to the water. Boil for 20 minutes. Remember to do the dyes separately. Or, mix blueberries and strawberries and see what happens. Remove the eggs, cut off the stocking and leaves. Then rinse your eggs. Rub vegetable oil on for a nice finish. Lastly, share any really special designs with me in the comment section below!